HomeNewsElectionsElections 2018Is ousted Representative John Carnevale seeking his old House District 13 seat? 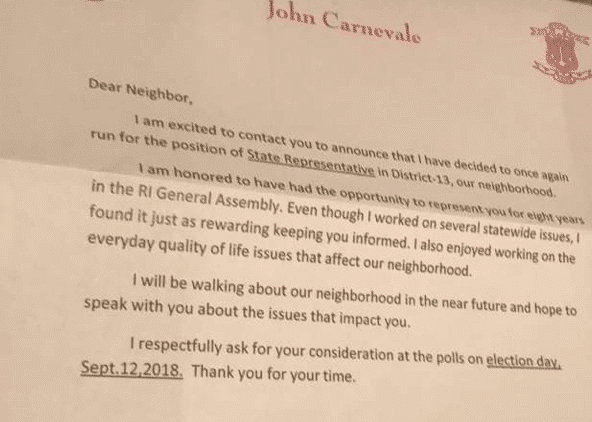 Is ousted Representative John Carnevale seeking his old House District 13 seat? Carnevale’s old seat is currently occupied by Ramon Perez, who was elected after Carnevale was removed from the voter roles in 2016. Carnevale was removed after a story by Channel 12 reporters Tim White and Ted Nesi indicated that the Representative did not live in the district he was elected to represent. In early 2017 Carnevale was charged with perjury and filing false documents. Go-Local Prov recently revealed that Carnevale was registered to vote at his 150 Barbara Street address in Providence, which is located in District 13. Carnevale is a former member of Speaker Nicholas Mattiello‘s leadership team. In 2016 Mattiello said that Carnevale’s actions were “unacceptable” and that he was unfit to serve in leadership. Here’s Carnevale after a Providence Board of Canvassers meeting in July 2016. His lawyer is fellow Rhode Island House Representative Robert Jacquard (Democrat, District 17, Cranston), also part of Speaker Mattiello’s leadership team.